The deal completes Dell's transformation from a consumer PC business to an IT solutions provider for companies. That process began when Dell bought Perot Systems for $4 billion in 2009 and went full throttle in 2013 when company founder Michael Dell took the business private. EMC is a behemoth of a corporate IT business. It is among the largest providers of storage hardware in the world. It also makes servers and owns security company RSA, which is known for its hard-to-crack SecurID tokens. And its most prized possession is its 81% stake in VMware -- the company that rules the world of virtualization software that allows businesses to run various operating systems on their devices. "The combination of Dell and EMC creates an enterprise solutions powerhouse," said Dell in a prepared statement. "Our new company will be exceptionally well-positioned for growth in the most strategic areas of next generation IT." Yet both Dell and EMC have struggled lately as new technology trends have largely passed them by (namely: the cloud). EMC made its name selling companies storage systems for their data centers. Now, cloud companies like Amazon can store all of a company's stuff for cheaper. It's no longer in vogue for businesses to operate their own data centers. Meanwhile, Dell, the world's second-largest server maker, is facing the same conundrum. As businesses offload their file storage to Amazon (AMZN), Google (GOOGL) and Microsoft (MSFT), many are letting those companies handle their email and Web serving too. Dell in particular has struggled lately -- it was the only top five server maker with falling shipments in the second quarter, according to tech consultancy Gartner. Both companies have invested heavily in the cloud, but each has encountered a rocky transition. EMC's stock sunk earlier this year, and it faced an activist shareholder revolt that failed to break up the company. Dell was forced to go private in a (very) leveraged buyout including large amounts of borrowing. Dell said the company will remain private -- for now. The complicated EMC deal will be financed with a significant amount of debt, while VMWare (VMW) will remain publicly-traded. Rival Hewlett-Packard (HPQ), for instance, is about to split into two: a consumer PC-focused business and a corporate IT solutions business. EBay (EBAY) jettisoned PayPal earlier this year. 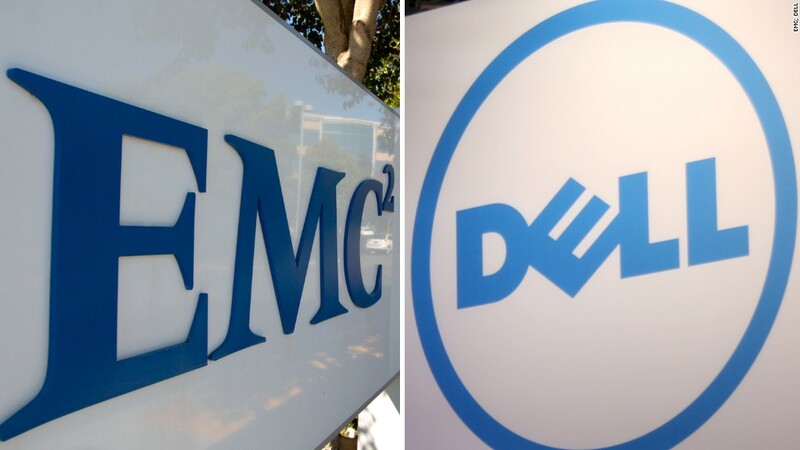 The EMC-Dell merger is remarkably huge. It's nearly twice as large as the proposed $37 billion tie-up between Broadcom and Avago, the next-biggest tech merger, according to Dealogic.